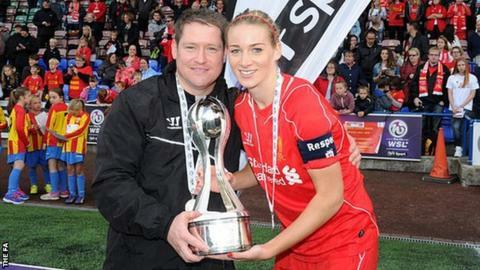 Captain Gemma Bonner says Liverpool are confident of retaining their title, despite a slow start to the season. Liverpool, champions in each of the last two seasons, are fourth in Women's Super League One with only six points from their opening four games. "There's a long way to go yet." defender Bonner, 23, told BBC Sport. "Anything can happen so we're definitely confident within the group that we've got a good enough squad to go and win the league." Liverpool suffered a surprise 2-1 home defeat by newly promoted Sunderland in their season opener and Bonner admits it took the team a while to click. "The first couple of games, we struggled for the performance levels we know we're capable of," she said. "We lost a lot of players in pre-season and we had new players come in as well. "I think you can see with every game that we're getting better and getting to know each other better." Bonner insists Liverpool can close the seven-point gap on leaders Chelsea in the 14 games remaining. "We've still got to play Chelsea and the other top teams again," she said. "We're confident that other teams will take points off each other, but all we can do is concentrate on ourselves and pick up as many points as we can. "I think there'll be a lot of surprises between now and the end of the season. "As short as the season is, we're confident that if we get the points on Sunday, then we'll still be within distance of the top come the second half of the season." Bonner's side play Notts County in their final match before the league stops for a nine-week international break, including the World Cup in Canada. Having played alongside a number of County's players at former club Leeds Carnegie, she says she knows where their danger areas are. "It's always nice seeing everyone," said Bonner. "We're all still close friends but at the end of the day, we'll be on different teams and we'll be doing our utmost for our teams to win. "They're really strong going forward. They've got Ellen White back in scoring form and that's a massive bonus so they're definitely a dangerous side."